For over 30 years, Top Down Systems has been known as the premier provider of Automatic Letter Generation (ALG) applications mainly used by insurance companies. To stay ahead of the market, Top Down realized that they would need to broaden their offering to go beyond letters and move into a full Document Output for Customer Communications Management (DOCCM) application. In 2013, Top Down reached out to my agency to help them reimagine their 8 installed ALG applications into one DOCCM web application. Our challenge was to retain the key features and certain frequently used interaction paradigms, while adding many more features in supporting of the additional communication platforms that were to be created. We began our engagement with an in-depth discovery session in which Top Down described the installed applications’ features, benefits, and usability pitfalls and share their vision for the new DOCCM app. Our first task was to provide an extensive application map where we laid out at a high level view of existing and new features. Once the map was in place, we were able to prioritize which sections of the application to work on first. We then created interaction flows, wireframes, design and click through prototypes which we used to facilitate several contextual usability studies. 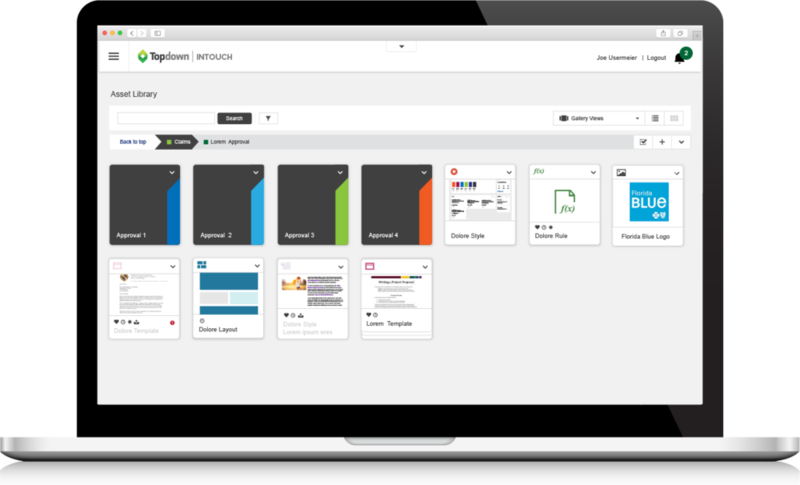 We ultimately delivered UX specifications and a visual style guide after the first 18 months, but continued to collaborate with Top Down by providing interaction flows and design solutions for another 4 years as the assigned design partner in their Agile development process.